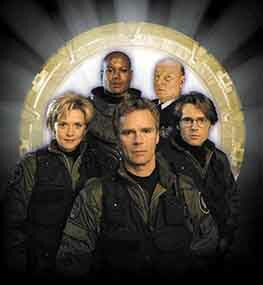 Nick Smithson: What are your very first memories of working on SG-1? NS: What were your first thoughts on your character? AT: I thought she was linear - one dimensional in that she came across as this out to prove herself feminist standing on her soap box and constantly ranting about equality. As a feminist I personally found this so tired and boring. So I talked to the writers about it and said: "Firstly women don't talk like this and secondly why can't she just be a member of SG-1 without constantly raising the flag that clearly points out that she is a woman. She's an integral member of the team. She loves the people that that she works with and would die for them and that is something that I really like about her. I really admire her incredible loyalty. And now, at long last she is starting to warm up a bit and have some fun. NS: How far will that fun go do you think? Do you think that Carter and O'Neill will, or should, ever get it together? AT: They should never be together. Sure there is the potential for them to fall in love and they are definitely attracted to each other and that's fine. But they also need to temper it with the fact that it's not going anywhere. We had sort of a three episode arc where you actually get to see them admit that they have deep feelings for each other. And we leave it with the two of them admitting it. We finally hear them admit out loud that they love each other. They practically say: "I love you, you love me. I would die for you, you would die for me." And this is not just because they are in the military. But it is made clear that this is as far as it goes - as far as it can go. NS: I'm sure the fans will be disappointed to hear that. AT: Our fans are great. They are so generous. Some of the things that people have come up to me and said are just amazing. I had this one woman who came up to me at a convention and said something to me that I will never forget. I was signing autographs and she came up and said: "You make me a better person." I didn't know how to react to that. I didn't know what to say. I was so shocked. She meant it from her heart and I thought: "I don't know how I've done that, but wow!" NS: Your character has a pretty heavy background in the sciences. Do you actually understand half of what your character says? AT: I actually studied as much as I possibly could for the role and when I found out I had got the role I only had two weeks to prepare. I hired a personal trainer to make sure I got the physical aspect of the character right. The science aspect was just homework really. I went on to the Internet, I read Stephen Hawking's book and anything else I could get my hands on to help me prepare for the role. I did this because I feel that the only way I can play my character is if I understand what she is talking about. She comes out with a lot of scientific technobabble and if I don't understand what I'm saying then I'm lying - I'm cheating. It would be so easy to read the script and put on an intonation that makes it sound as if I know what I'm saying, but it works better for me if I really do understand what she is talking about. NS: How do you relax between takes. Do you all chill out together? AT: We do get on incredibly well together. I know this sounds like a cliché but we are like one big happy family. Richard has a great sense of humour, Christopher Judge has a wonderful sense of humour and possibly one of the best laughs I've ever heard. These elements, coupled with all these goofy, wacky people, are what keeps us sane on the set. We really do, on the whole, have a great time. For a list of other relevant sites click here.